The 125th session of the Human Rights Committee took place in Geneva from 4 to 29 March 2019. Amin Fathalla was appointed new Chair of the Committee. Tania Abdo Rocholl, Yuval Shany and Photini Pazartzis were appointed as Vice-chairs and Izle Brands Kheris as Rapporteur. Bamariam Koita was appointed as the new focal point on reprisals against individuals who cooperate with the Human Rights Committee. The Committee reviewed the reports of four State parties on the implementation of the ICCPR: Estonia, Niger, Angola and Vietnam. Additionally, Eritrea and Saint Vincent and the Grenadines, were reviewed in absence of report after a delay of 16 and 29 years respectively. The Committee also adopted 7 lists of issues in relation to: Senegal, Central African Republic, Cabo Verde, Finland, United States of America, Dominica and Lesotho.The List of Issues will be available in the coming weeks. The Committee adopted the report on Follow-up to Concluding Observations which assesses the information received on the implementation of the Committee’s recommendations in relation to five States: Austria, South Africa, Denmark, Sweden and Kuwait. The report highlights important progress made in those five countries. During this session, the Committee considered 43 draft decisions under the individual communication procedure. The Committee decided to postpone the consideration of one draft to its 127th session in October pending additional information from the parties. Out of the 42 decisions adopted, 25 were decided on the merits, 8 cases were declared inadmissible and 9 were discontinued. Regarding the cases decided on the merits, the Committee found violations in 18 of them and non-violation in 7. It is important to highlight that 6 cases were discussed in dual chambers as a new measure of the Committee to deal with the backlog of the individual communications. 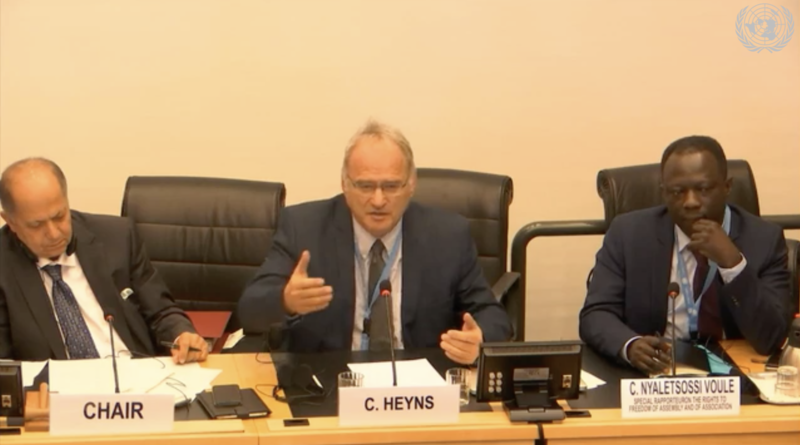 The rapporteur for the new General Comment on article 21 of the ICCPR (right to peaceful assembly), Christof Heyns, launched the drafting process with a day of general discussion with NGOs, academics and other stakeholders. The general discussion was attended by Clément Voule, Special Rapporteur on the rights to freedom of peaceful assembly and of association, and several NGOs and academics who delivered oral interventions and exhanged with Committee members about the main issues to be considered for the new GC. The Committee received 43 written contributions and 4 videos from various stakeholders. The first reading of the draft GC will start in July 2019. The final text is expected to be adopted by the end of 2020.